To protect the motherland from foreign invasion, to maintain peace and stabilize border tension, to maintain a balance of strength among neighboring countries, military expenditure is inevitable. On the other hand, if huge money is spent to continue the war game with neighboring countries that shrinks the funds available for investing in health, education, infrastructure, and industrialization. Under this controversy, some researchers feel increase in military expenditure raises national income through multiplier effect, but another group thinks it crowds out investment for generating employment and reduction of poverty especially in developing countries. In this chapter an attempt has been taken to investigate the relation between military expenditure and its impact on economic growth of some South Asian nations (e.g., India, Pakistan, Sri Lanka, and Bangladesh) by giving special importance to India. 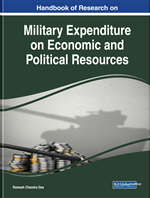 Economic impacts of military expenditure can be studied from various facets. The basic economics says that given our technical knowledge and endowment of resources, more production of one commodity results in less production of some other commodities. Naturally if more money is spent on defense results a decline of funds for production of civilian goods. Some researchers feel defense spending promotes economic growth if some of the expenditures are used for the creation of socio-economic infrastructure like roads, bridges, airports, hospitals and so forth. Moreover, defense spending leads to formation of human capital, if the part of defense spending is used for education, training, discipline and so forth. Military spending can provide protection to the citizens where internal and external security promotes market exchange. Other researchers feel defense spending can affect economic growth negatively if it can crowd out the private investment and less investment on public goods like health, education and research and development. So proper understanding on the relationship between defense spending and economic growth is very important issue. It is a very important but tough task to balance national security and economic growth. National security is the first priority in every nation, but huge spending on defense can be a large burden for government and detrimental to the welfare of the people of that nation. Therefore, effective budget plan for defense spending is needed. According to Stockholm International Peace Research Institute (SIPRI), World military spending have crossed the figure of $1.63 trillion in 2010, which shows a 1.3% increase since 2001 (Anwar, Rafique & Joiya, 2012). Thus military spending constitutes a significant share of global resources but despite its significant size its economic impact has only recently been an issue of analysis in economic theory (Dunne J.P, 2011). In the study done by Anwar, Rafique and Joisa (2012) clearly depicted this trade -off between defense spending, military stockpile, security of the nation and civil consumption given government budget constraint shown in upper panel. If the government decides to spend more on defense through military stockpile which raises its military power or security of the nation (shown in the lower right panel) which ultimately declines civil consumption. Though there has been a plethora of studies on military expenditure and its impact on economic growth relationship over the last three decades. These studies are based on different methodologies, models and econometric techniques and focusing on individual case studies, cross country studies or panel data studies. Despite the number and variety of studies, the evidence on defense–growth nexus is still from conclusive that is there is no consensus regarding this issue. The age old Kashmir issue, P.O.K issue, border problem in Arunachal Pradesh, Gorkhaland issue, and other northeastern insurgency issues, weapon race with Pakistan, for balance of strength and to maintain peace with neighboring countries, the present bureaucratic relation with the super power of Asia that is China etc. makes the main area of concern of the government of India. Similarly, defense spending of Pakistan remains very high due to long standing conflicts and arms race with our country and its geo political position in Afghanistan and internal incidents of terrorism. Similarly, internal insurgency problem in Sri Lanka, internal political crisis in Bangladesh encourages the governments to join in the arms race and strengthen the defense sector. Despite scarcity of resources in these South Asian Nations, a significant proportion of budget is diverted towards military expenditure on grounds of internal security and external threat perceptions. Thus this is an area of investigation for researchers as it may have serious implications to growth rate of output, employment, poverty and malnourishment of underprivileged section of the society. Under these circumstances it becomes pertinent to reinvestigate the defense spending-growth nexus in these regions. In this study an attempt has been taken to investigate the relation between military expenditure and its impact on economic growth of some South Asian nations e.g, Pakistan, Sri Lanka, Bangladesh and specially in India. Economic Growth: Generally economic growth means sustained rise of income. Later on, economists argue it should be sustained rise of per capita income. With the increases of inflation some economists opined for getting better measurement of development we should consider real per capita income. Which can be obtained by subtracting the inflation from nominal per capita income. In this paper gross domestic product per capita growth is being considered as economic growth. VEC and VAR Model: These are the two techniques generally used in the time series econometrics. VEC is Vector Error Correction method and VAR is Vector Auto regression method. When two variables are cointegrated, then they must be presented by Error Correction mechanism. This tool proves the stability of the long run relationship. The estimated coefficient of ECM term generally shows negative sign and less than one. It is also known as speed of adjustment. How the previous error is corrected in the present time is reflected by this term. Short run causality can be observed from VEC model estimation. On the other hand, for getting long run causality we apply VAR model. This model can be applied even if two variables are not cointegrated. India, Bangladesh, Pakistan, and Sri Lanka: All the countries of the world are trying to develop their defense power to protect her own nation from enemies’ bloody eyes. In this study only four countries from South –East Asia has been taken as a preliminary attempt to investigate this relationship. Though applying the same techniques, the number of countries may be increased. Due to lack of time and other constraints this paper confines only with these four nations. It would have been better if we could incorporate China also. This may be kept as scope for future research. Military Expenditure: Government expenditure for Defense. To protect the country from external attack, to maintain fair election for the protection of democracy, to combat against terrorism, every country spends some portion of their total expenditure for strengthening their defense power. This expenditure includes both the defense capital expenditure and defense current expenditure. Though according to latest estimate to maintain a powerful defense we need to spend 6% of GDP but in practice Indian government is spending much less than the requirement.